This article talks about 5 best DVD burner software for Windows 10. Optical discs have long been a popular medium of archiving and transferring data, and that’s still the case. Whether it’s movies, songs, or other general files, Optical Discs such as DVDs remain the choice for distribution. Heck, even our computers’ Operating Systems are released on DVDs. That’s the reason it’s important to have a good DVD burner software application installed on this computer. And that’s exactly what this blog post is all about; the best DVD burner software applications for your Windows 10 PC. These DVD burner software are free, lightweight, and can easily write content to CDs, DVDs, and even Blu-Ray discs. In addition to that, they can also create Audio CDs, bootable discs, and disc images. Getting hyped already? Let’s jump in, and know more about 5 best DVD burner software for Windows 10. Lightweight, easy to use, and feature loaded; BurnAware is a perfect DVD burner software for Windows 10 that can single handedly take care of all your disc burning needs without requiring so much as a breather. 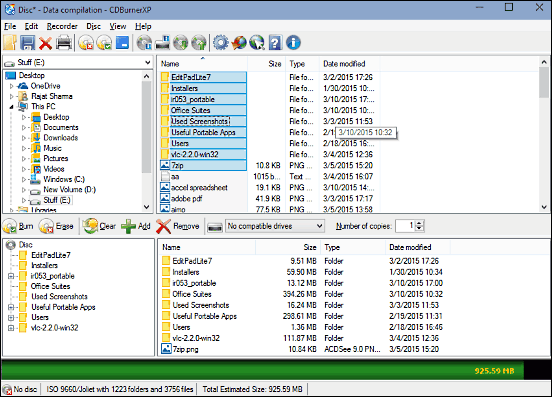 The freeware application can easily burn DVDs, CDs, and the latest and greatest Blu-Ray discs. In addition to that, it supports multisession discs, and can create even create bootable CDs and DVDs. You can also create Audio and MP3 discs. Think that’s all? Hardly. BurnAware can also create video discs, copy disc data to ISO images, and then burn these ISOs to CDs and DVDs. The program also lets you erase rewritable discs, check discs for errors, and extract data from corrupted discs. Using BurnAware is pretty straightforward; select the operation that you want to perform, insert the DVD, add the files that you want to burn, and hit the “Burn” button. You can read more about it here. If you want a DVD burner software for Windows 10 that has a ton of features, look no further than CDBurnerXP. This gratis application has a whole laundry list of goodies crammed into it. CDBurnerXP supports pretty much every kind of optical disc out there, ranging from the near obsolete CD-R to the futuristic Blu-Ray; and is compatible with both single and dual layer discs as well. Apart from that, it can create MP3 discs as well. You can make bootable discs, and have CDBurnerXP verify the written data automatically after the burning process has finished. It can erase rewritable discs as well. CDBurnerXP includes a handy bunch of features related to Audio-CDs, and you can create Audio-CDs using a bunch of popular formats such as MP3, OGG, WAV, APE, and ALAC. The application can also burn gapless discs, and includes the ability to directly import M3U playlists and CUE sheets. Add to it the fact that you can create and burn ISO files and also convert them, and CDBurnerXP gets even more awesome. Visit this link to know more about it. Think an application can’t be straightforward and capable both at the same time? Think again, as that’s exactly what ImgBurn is. This free DVD burner software for Windows 10 is extremely easy to use, thanks to a UI that displays all the primary functions of the program front and center. All you have to do is select what you want to do, add the files/folders and other essential information (disc label, file system, creation date etc. ), and ImgBurn will take it from there. In addition to DVDs, the application supports effortless burning of CDs, HD-DVDs, and Blu-Ray discs. You can create simple data discs, audio discs, and even bootable ones. Apart from that, ImgBurn can create ISO files from your choice of files, as well as directly from the discs. Once the data has been written to the disc, ImgBurn can verify it as well. It also includes an “Automatic Write Speed” feature, which lets you set a preferred burning speed on a per drive basis. Click here to find out more about it. Seeing InfraRecorder for the first time, it’s hard to ignore the similarities with the just discussed ImgBurn. The UI of the program is pretty much the same, and primary options are displayed on the startup screen for easy selection. However, even though it’s not the most feature loaded, InfraRecorder is a fairly capable application that has a bunch of goodies of its own, which make it a viable DVD burner software for Windows 10. In fact, if you’re looking for a basic disc burning application, InfraRecorder will do just fine. The program supports multi-layer DVDs and CDs, and can be used to easily author a variety of discs, such as data discs, audio discs, and video discs. You can also create mixed mode projects and burn them to either physical discs, or ISO files. It can also create copies of discs pretty fast using temporary disc images. 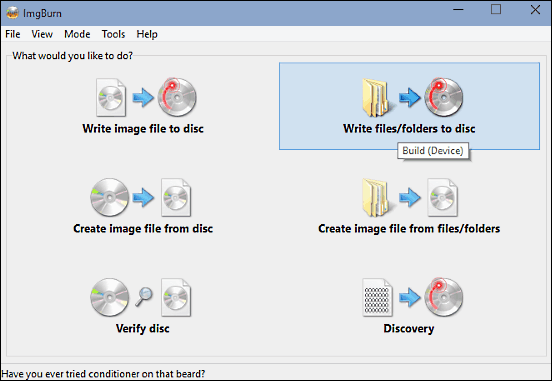 InfraRecorder supports multi-session discs, and can erase rewritable discs using a variety of methods. All in all, it’s simple, and works well for what it is. And it’s portable as well. Check out more about it here. Finishing off is Astroburn Lite, which is probably the funkiest looking application on the list. 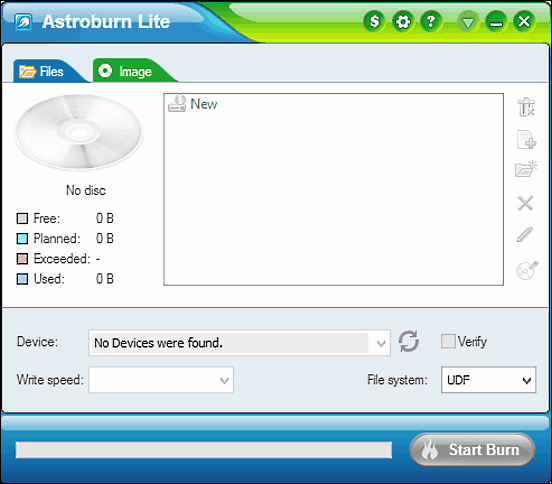 Astroburn Lite makes quick work of burning your data to CDs, DVDs, and Blu-Ray discs. It’s ridiculously simple to use, as there are no confusing windows, long menus, or anything like that. Astroburn Lite automatically detects the installed disc drive(s), and is ready to use the moment you fire it up. All you have to do is add the files (and folders) that you want to write to the disc, configure additional options (file system, write speed etc. ), and click the “Start Burn” button. That’s it. The application can also verify the data written to the disc. You can create disc images, and even erase rewritable discs. Astroburn Lite supports all image formats such as ISO, BIN; and even supports metadata formats such as CUE. Best of all, you can customize Astroburn’s appearance as well, thanks to a bunch of pre-loaded skins it comes with. To sum it up, it’s a fine little DVD burner software for Windows 10. Visit this link to find out more about it. Disc burning is one of the most commonly performed activities by computer users, and the above mentioned DVD burner software for Windows 10 ensure that you can do that with minimum to no effort. Try them out, and let me know which ones you find the best in the comments below.